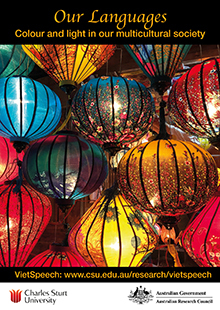 Following Refugee Week 2018 last week, researchers at CSU seek Vietnamese-Australians aged 18 and over to participate in a study that examines their use of Vietnamese and English while living in Australia. Following Refugee Week 2018 last week, researchers at Charles Sturt University (CSU) seek Vietnamese-Australians aged 18 and over to participate in a study that examines their use of Vietnamese and English while living in Australia. 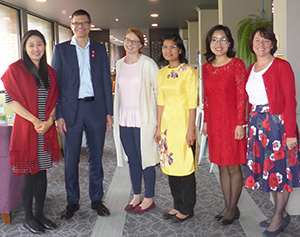 The ‘VietSpeech’ research project is funded by an Australian Research Council (ARC) Discovery Grant and is titled Vietnamese-Australian children’s speech and language competence (DP180102848) and is led by Professor Sharynne McLeod and Dr Sarah Verdon. Dr Cen Wang, Dr Van Tran and Ms Ben Phạm are project team members (pictured with CSU Vice-Chancellor Professor Andrew Vann). Researcher Professor Sharynne McLeod (pictured far right) in the CSU School of Teacher Education in Bathurst said, “Australia is one of the most diverse multicultural countries in the world, and multilingualism benefits individuals and societies − culturally, economically and socially. Professor McLeod notes that Vietnamese is one of the top five languages other than English in Australia (along with Mandarin, Arabic, Cantonese, and Italian) and is spoken by 1.2 per cent of the Australian population (Australian Bureau of Statistics, 2017). “The Vietnamese community, with the majority entering Australia in the 1970s-1980s, is at a key point in time in terms of the maintenance of their home language,” Dr Verdon (pictured third from left) said. The researchers said the VietSpeech project aims to support Vietnamese-Australian children and families to maintain their home language, enhance speech skills in Vietnamese and English, and equip English-speaking professionals to support multilingual children’s speech. “We invite people with Vietnamese heritage who are living in Australia and are 18 years and over to answer a comprehensive survey examining their language maintenance,” they said. Contact CSU Media to arrange interviews with Dr Cen Wang, Professor Sharynne McLeod, and Dr Van Tran who are based in the CSU School of Teacher Education in Bathurst or Dr Sarah Verdon who is based in the CSU School of Community Health in Albury-Wodonga. Photo at top (left to right): Dr Van Tran, CSU Vice-Chancellor Professor Andrew Vann, Dr Sarah Verdon, Ms Ben Pham, Dr Cen Wang, Professor Sharynne McLeod.